Talking about rules, dont you have to have a mini fig as your pilot? Wow, that Mr. Freeze mech looks really slick! I hope to finish mine this weekend. It is mostly done, just need to fix some details and add some guns. naugem wrote: Wow, that Mr. Freeze mech looks really slick! I was thinking about doing one, but not anymore. rofl. volumex wrote: Talking about rules, dont you have to have a mini fig as your pilot? Brick built characters are allowed for cases where a minifig is insufficient. Stan lee is TOTALLY a superhero! And even if he doesn't count, I want to see the mech anyways. The only time (as far as I can tell from my limited research) that Stan Lee could have been considered a super hero and not just a cameo or background character was when he was Mr Fantastic, which would mean the super hero was still Mr Fantastic and not Stan himself. I'll just wait here for someone to prove me wrong though. I'm sure I am, and I want to see such a mech, I just don't think it would clear the rules and I'm not going to start making exceptions because it would probably look cool. Solo wrote: The only time (as far as I can tell from my limited research) that Stan Lee could have been considered a super hero and not just a cameo or background character was when he was Mr Fantastic, which would mean the super hero was still Mr Fantastic and not Stan himself. 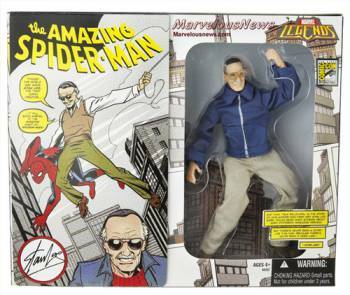 Does it count for the comic book series "Stan Lee meets..." With characters such as Spiderman, Dr.Strange, and The Thing. If you've read those, does that count? I haven't read those so I looked them up. Sure seems like he's clearly not a super hero or super villain in any of that. Just himself interacting with his characters. I love Stan Lee as much as the next comic-book geek; one of my most treasured Comic-Con memories involves Stan-the-Man; but he's not a DC or Marvel character, isn't owned by DC or Marvel. He's a character, yes, on many levels, but not a character owned and licensed by DC or Marvel, which the spirit of the rules requires. I'd still would like to see a Stan Lee inspired mech in the MOC Showcase. Solo wrote: I haven't read those so I looked them up. Sure seems like he's clearly not a super hero or super villain in any of that. Just himself interacting with his characters. Would a mech for Bruce Banner be legal? You know, for those occasions when he just can't seem to get angry? 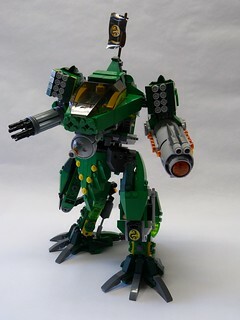 cooperdiem wrote: Would a mech for Bruce Banner be legal? You know, for those occasions when he just can't seem to get angry? lol, I can't wait to see that. Ahahaha, is Bruce hitting the anger management facility like he's supposed to these days? The Mech is done so there’s no point waiting until the end of the month. I present a Mech for IRON FIST! Daniel Rand was the son of a wealthy businessman. He was on an expedition with his father when they found the mystical city of K’un-Lun, which appears in the Earth’s plane once a decade in the Himalayas. During the expedition, Daniels father was killed by a rival associate. Daniel vowed vengeance for his father’s death and studied under the K-un-Lun masters. He eventually grew and earned an opportunity to win the power of the Iron Fist by confronting Shou-Lao the Undying. Daniel slew the beast and plunged his hands into the flame which contained the Iron Fist power. When the city appeared again in the Earth’s plane, Daniel left K’un-Lun for New York. He has since worked as a member of Heroes for Hire and the Avengers. Mech story: Daniel felt that to take his heroism to the next level, he would construct a Mech to channel the Iron Fist force within him. This manifestation takes form in the left-hand blaster on the Mech. Daniel designed the machine to be as agile and quick as he could be. Iron Fist now roams the city streets, more dangerous than before. Thanks for the great contest FBTB! It’s always a good time!